"Romance of the Three Kingdoms" is one of the four great Chinese classic literature masterpieces. The book was the very first novel written in episode-chapter format. The book depicted the loyalty character manifested by people during the warring period between the three kingdoms "Wei", "Shu", and "Wu". The author was Luo Guan-zhong, who lived in the late Yuan Dynasty and the beginning of Ming Dynasty. The book was written based on real history. 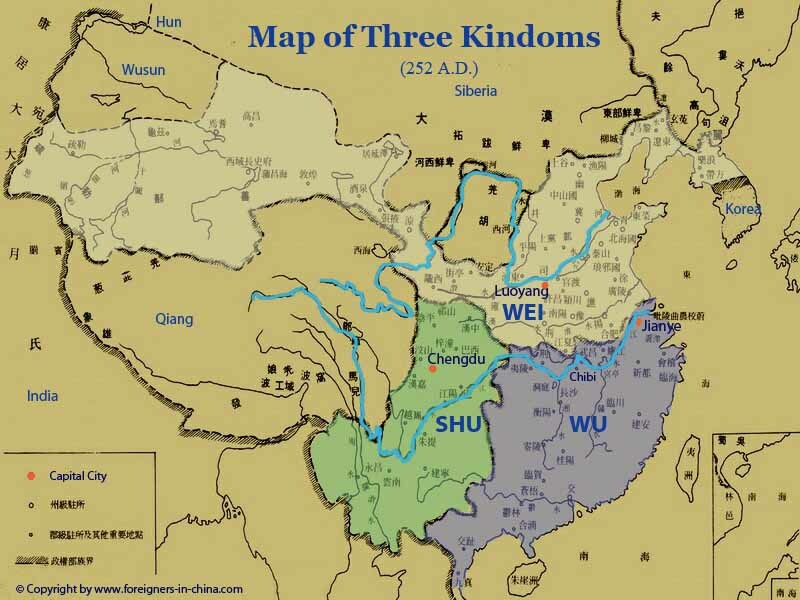 The Three Kingdoms existed during the period from 220 A.D. to 280 A.D. At that time, China was divided into three parts. The Wei Kingdom governed by Cao Cao was the strongest occupying the north side of China. The Shu Kingdom governed by Liu Bei occupied the south-west part of China. The Wu Kingdom governed by Sun Quan occupied the south-east part of China. Each of the three kingdoms had a capable governor, a group of strong military generals, and very smart strategic consultants. Individually speaking, every governor of three kingdoms was kind to the people, was good at finding capable and virtuous persons to work for him and giving them important positions. So all three governors were governing their own regions quite well. They all had the ambition to unite the whole China. The three kingdoms warred against each other for half a century. Go to top of page "Romance of the Three Kingdoms - I. General Introduction"
Return from "Romance of the Three Kingdoms - I. General Introduction" to "Foreigners in China" Home Page.